When it comes to feeding rabbits, many people have it all wrong thanks to Bugs Bunny, Easter decor and every other image that pairs rabbits with carrots. So what do rabbits eat? In reality, domesticated rabbits thrive on a diet that consists of hay, leafy greens and grass-based pellets. Carrots are just a treat, and one that should be offered sparingly. So if you’re a rabbit owner or you’re considering becoming one, here are a few tips for creating a healthy food plan for your rabbit, one that includes plenty of variety, including an occasional slice of carrot. Hay should make up between 70 and 85 percent of a rabbit’s diet, according to information on rabbit care provided by the NC State Veterinary Hospital. The most common types of hay available in pet stores and feed stores are timothy and orchard grass. Both are great for rabbits. Another hay you’ll run into in pet stores is alfalfa hay. This type is good for young rabbits (younger than six months old) and lactating females but contains too much calcium and protein for other adult rabbits. A good source of fiber, hay protects a rabbit’s intestines and prevents fur chewing, hairballs and overgrowth of bacteria that can lead to diarrhea and death, according to a publication on rabbit nutrition by the University of California. Hay also keeps a rabbit’s teeth healthy, according to West Boulevard Veterinary Clinic in Vancouver, B.C. A rabbit’s teeth grow continually throughout its life, and by chewing hay, they keep their teeth worn down to a healthy length. If a rabbit’s teeth grow too long, they can end up with mouth sores and infections. In the wild, rabbits forage for a wide variety of plants, so it makes sense that domestic rabbits also benefit from eating a variety of fresh leafy vegetables and herbs. In fact, the fresh portion of a rabbits diet is just as important as the hay, according to Northwood Animal Hospital in Irvine, Cali. Fresh vegetables provide rabbits with important nutrients and water. Rabbits should be fed a minimum of 1 packed cup of green foods per 2 pounds of body weight each day, or about half the size of the rabbit if placed in a loose pile, according to Northwood. This salad should consist of at least three different types of dark green leafy vegetables. Some examples of good greens for rabbits include mustard greens, parsley, beet greens, swiss chard, radish tops, basil, cilantro, red lettuce, carrot tops and kale. High quality rabbit pellets can provide vitamins and minerals that a rabbit might not get if fed only hay and fresh vegetables, according to Dana Krempels, a biology professor at the University of Miami who authored the online resource “What Should I Feed My Bunny?” However, Krempels cautions against feeding a rabbit too much pellet food, which can cause them to become obese. Pellets can also cause rabbits to stop eating hay, which is crucial to their health. Many veterinarians suggest feeding your rabbit no more than ⅛ cup of quality pellets per 5 pounds of rabbit per day, according to Krempels. Furthermore, not all rabbit pellets are equally nutritious. Steer clear of pellets that contain dried fruit, seeds, nuts and colored bits, which can cause serious digestion problems. A good quality rabbit pellet should have at least 22 percent crude fiber and no more than 14 percent protein, 1 percent fat and 1 percent calcium, Krempels said. It can be fun to feed your pets treats, but keep in mind that rabbits have sensitive digestive systems and can’t tolerate most of the foods that humans eat. Fruits are the best treats for rabbits, and more specifically, high-fiber fruits, according to a publication on rabbit nutrition by the University of California. Papaya, peaches, pears, pineapple, raspberries and strawberries are all OK bunny treats — but only in small amounts. A small slice or a couple small berries is all your rabbit should have in a day. If a rabbit eats too much sugar, it can cause an imbalance in its digestive system. It can also cause obesity. Like every other mammal, rabbits require water and plenty of it. While rabbits will drink from a bottle or a bowl, a 2011 study conducted by the University of Zurich found that rabbits preferred to drink from open dishes. However, rabbits also tend to knock over dishes. To prevent this, try using a heavy bowl. Refresh the water every day. If you catch a rabbit eating its poop, don’t worry. Rabbits produce a special type of dropping called a cecotrope, which is greenish, made up of several little balls and covered in mucus. Rich in nutrients, cecotropes are usually eaten by rabbits directly, according to Northwood Animal Hospital. Therefore, you likely won’t see them scattered around the cage. If you do, then the rabbit may have a diet that’s too rich in nutrients or your rabbit may have a health problem. If your rabbit stops eating and pooping, it could be serious, and you may have a short window of time to act. A condition known as gastrointestinal stasis is fairly common in rabbits. This is when the rabbit’s intestines essentially stop working, and it can be fatal. 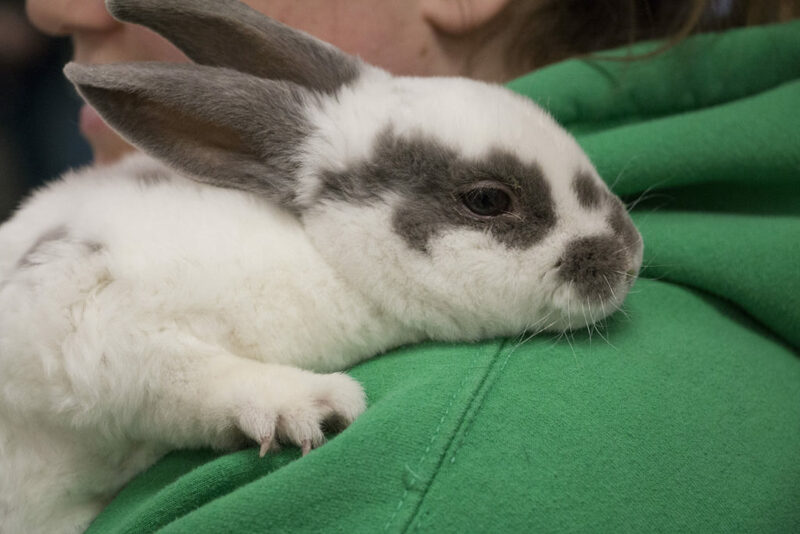 In an article about this “silent killer,” Krempels states that if a rabbit hasn’t eaten or pooped for 12 hours, it should be taken to the veterinary clinic immediately for treatment. Having a relationship with a veterinarian who’s knowledgeable about rabbits is important for all rabbit owners. In addition to helping in emergency situations, a veterinarian can offer advice on what to feed your rabbit and help you monitor its weight and overall health. While there are many good resources out there about rabbit care, sometimes consulting an expert is best.